This report covers the reoccurring colour palettes present during the Fall/Winter 2018 New York Fashion Week and how those colours translated into retail. 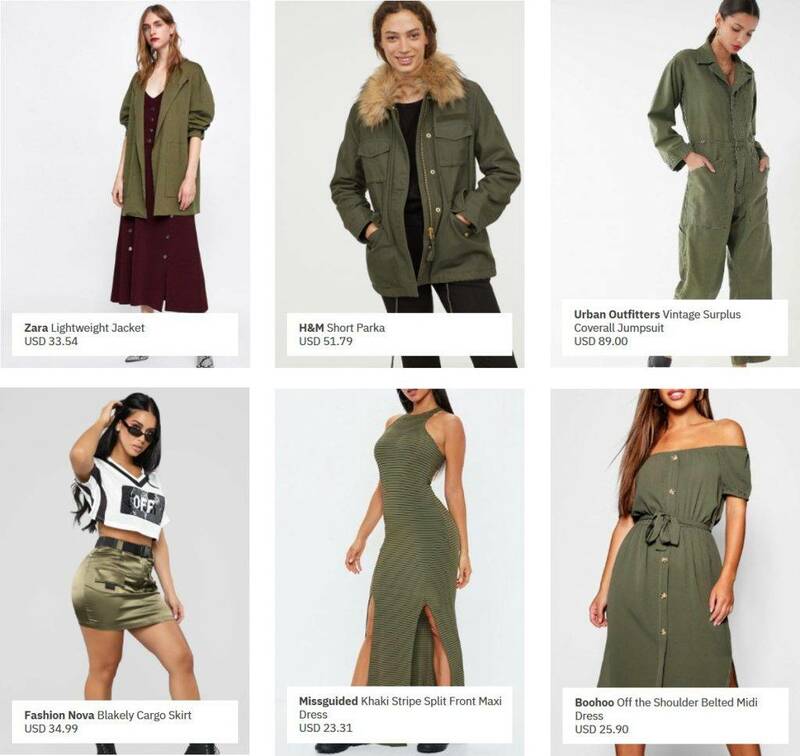 Data was extracted from the top 10 biggest fast e-tailers like Zara, Fashion Nova, Missguided and more. From there, styles among the key colour trends were analysed to determine what did well and what did not. Pantone® Fashion Colour Trend Report Fall/Winter 2018 edition for New York Fashion Week showcased a surprising set of striking, bold and rich colour palettes with touches of unexpected soft pastel shades. From Oscar de la Renta to Marc Jacobs, these non-traditional colours that collectively exude self-expression, individualism and confidence were prominent. Four distinct colour stories were established from the runways – Dark Opulence, Vivid Punch, Pale Royal, and Classic Neutrals. 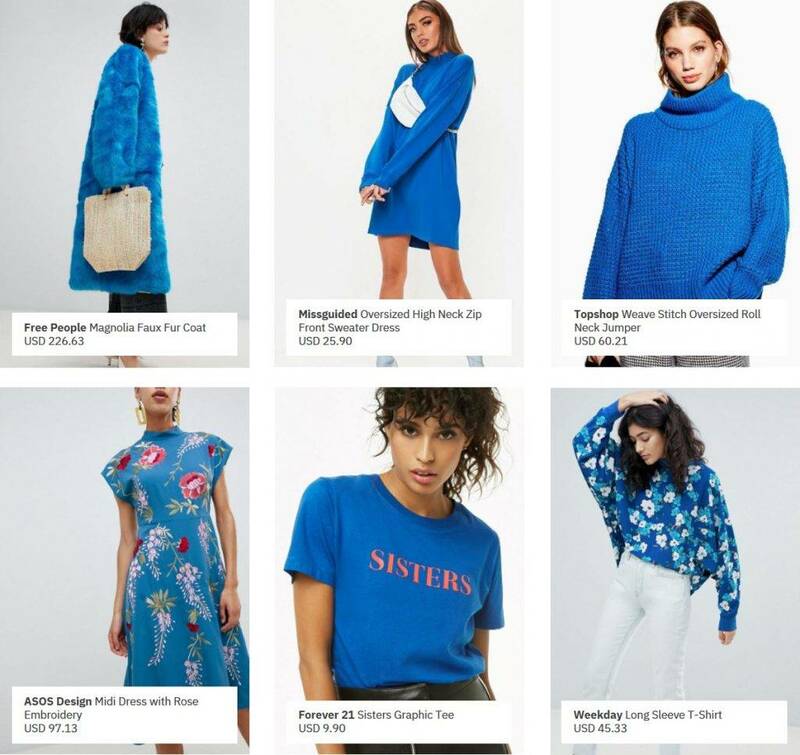 We looked at how these colours fared on the retail front by analysing 10 of the biggest fast fashion e-tailers with a combined 186,355 data points and drew focus on women’s tops, outerwear, dresses, skirts, and playsuits & jumpsuits. Note:  Omnilytics technical colour names that correspond to the Pantone colours were included for analysis purposes. Total newly added SKUs in Fall/Winter 2018 Pantone colours was recorded at 6,260 items across the 10 e-tailers analysed. 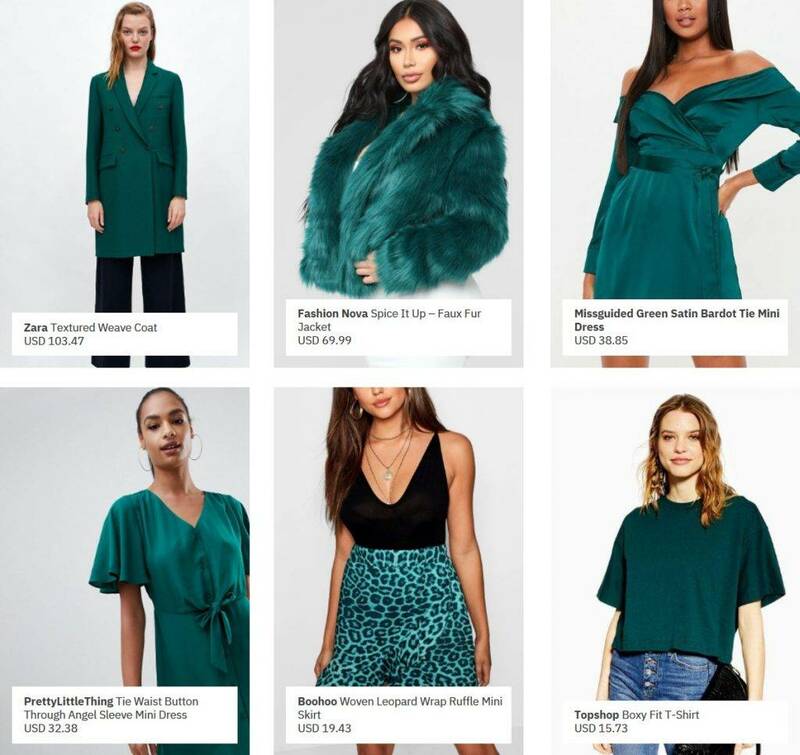 Classic Neutrals commanded the biggest newness in volume while Dark Opulence with bold regals dominated the new-in SKUs for fashion seasonal colours. 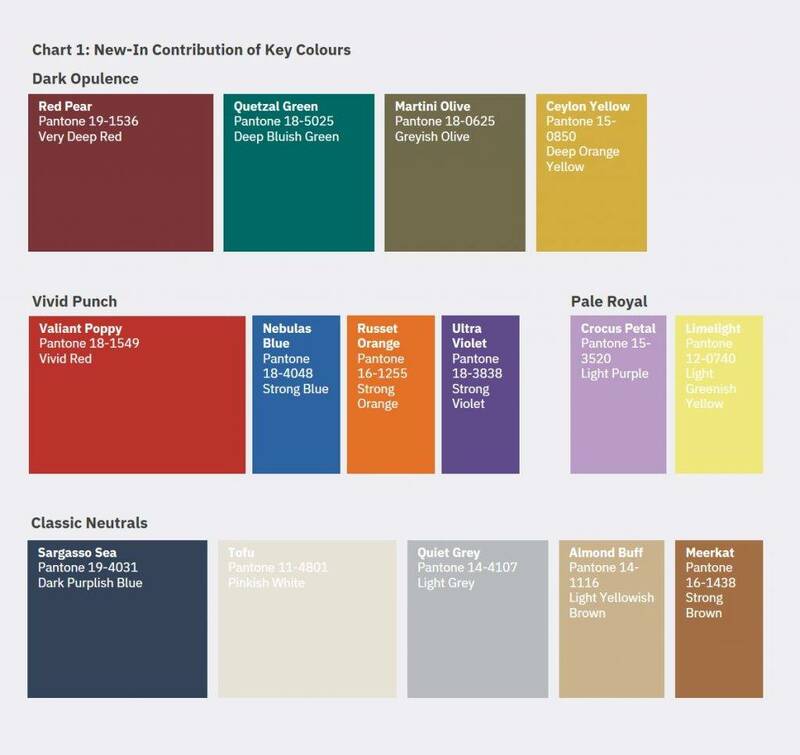 Vibrant, striking colours within the unexpected Vivid Punch palette accounted for 17% of the newly added SKUs. Red was the most prominent colour, with Valiant Poppy accounted for 24% (the highest percentage of new-in amongst all new shades of Red), followed by Red Pear at 21%. 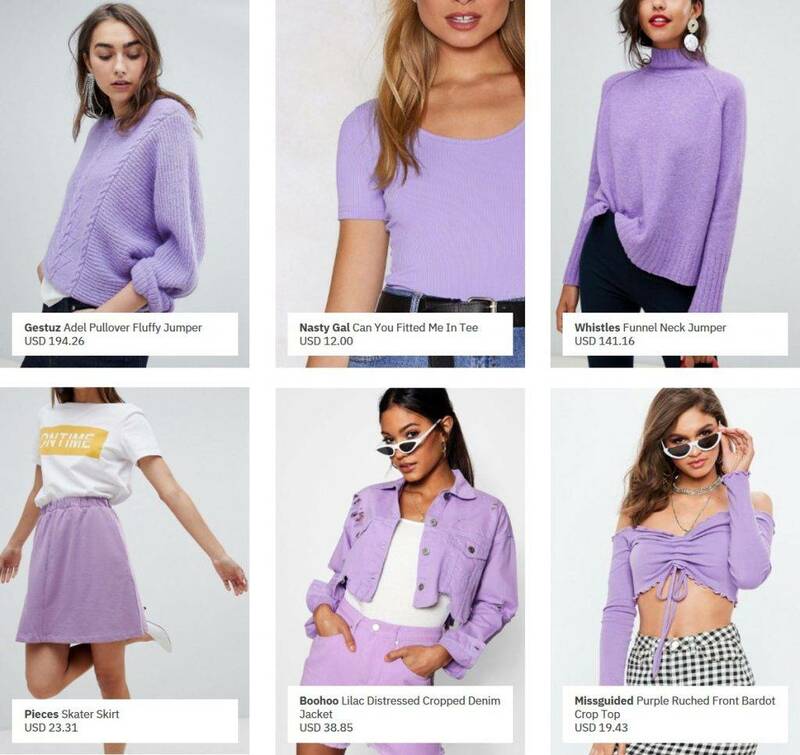 Ultra Violet, which was named Pantone Colour of the Year 2018, surprisingly captured only a mere 2% new-in rate. 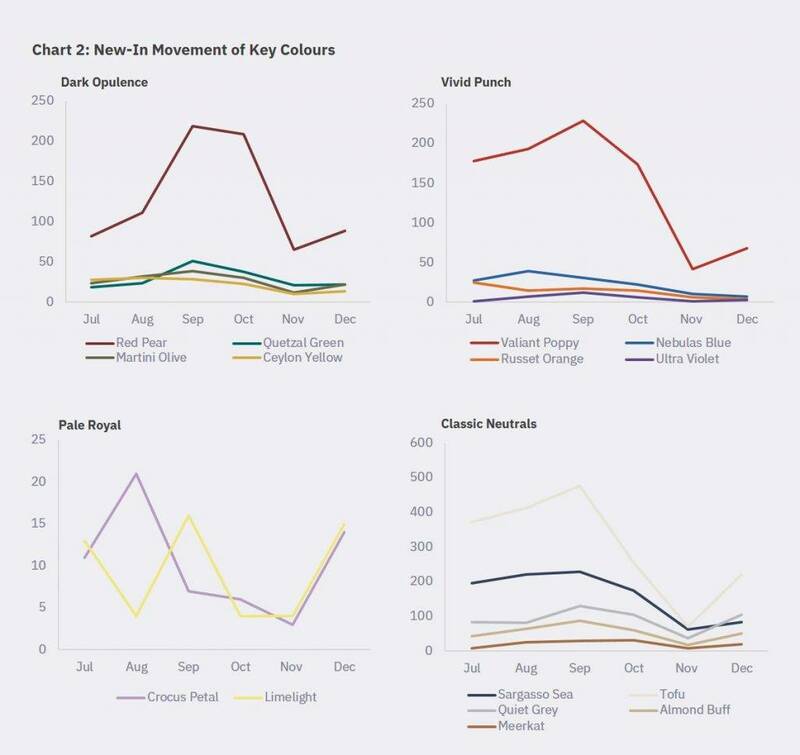 The key seasonal colours increased in August (refer to Chart 2) to gear up for Fall, with the highest peak in September, especially across the Dark Opulence palette. All colours experienced a dip in November before rising again in December, except for Vivid Punch (Nebulas Blue, Russet Orange and Ultra Violet continued declining towards the end of the season). Pale Royal fluctuated throughout the season but was stocked at a relatively low quantity, as pastels are traditionally less synonymous to fall or winter colour choices. Meanwhile, Classic Neutrals, which consisted of staple neutral colours predictably showed a steady presence throughout the season. 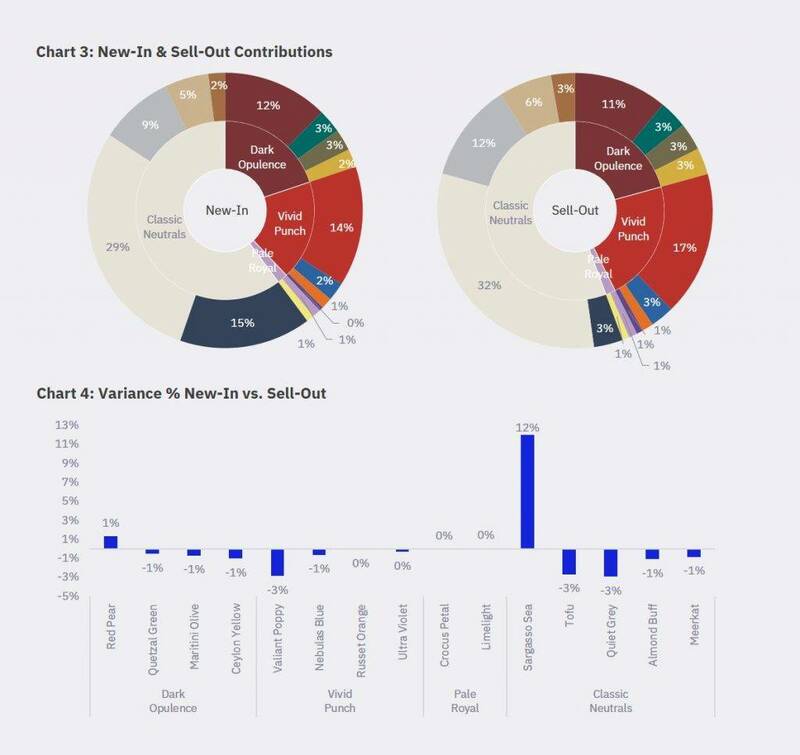 Overall, most of the Pantone colours performed well across the 10 e-tailers, as sell-out closely matched new-in contributions (refer to Chart 4). This suggests that the fast fashion brands were spot on in tailing the runway colours and interpreting for commercial success. Dark Opulence and Vivid Punch palettes were evidently the performing colour trends. 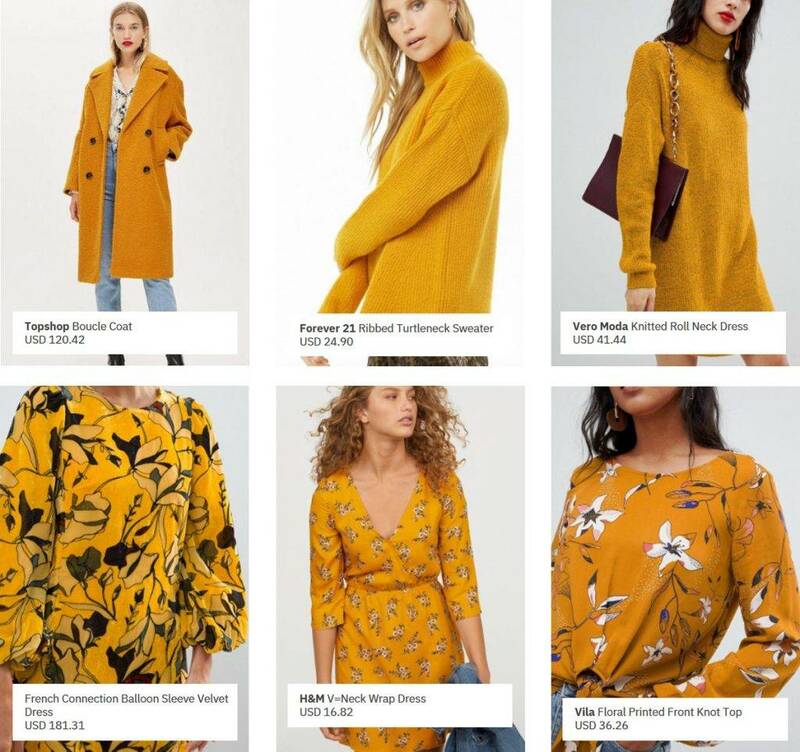 Valiant Poppy (Vivid Red) not only registered a sell-out that over-performed its newness contribution by 3% but it was also the biggest contributor to sell-out amongst the fashion seasonal colours (refer to Chart 3). Similarly, Pale Royal matched the sell-out rate with its new-in contribution too, despite contributing only 2% of total new-in. Although Classic Neutrals contributed to the biggest newness, it observed a huge gap between its new-in and sell-out contribution as depicted by Sargasso Sea at 12%, which clearly showed signs of overstocking. On the other extreme, Tofu and Quiet Grey recorded -3% variance against sell-out, indicating missed opportunities. In the subsequent pages, we pulled together the bestselling and slow-moving styles for Dark Opulence, Vivid Punch and Pale Royal for a visual understanding on what has worked and what did not for fast fashion throughout FW2018. 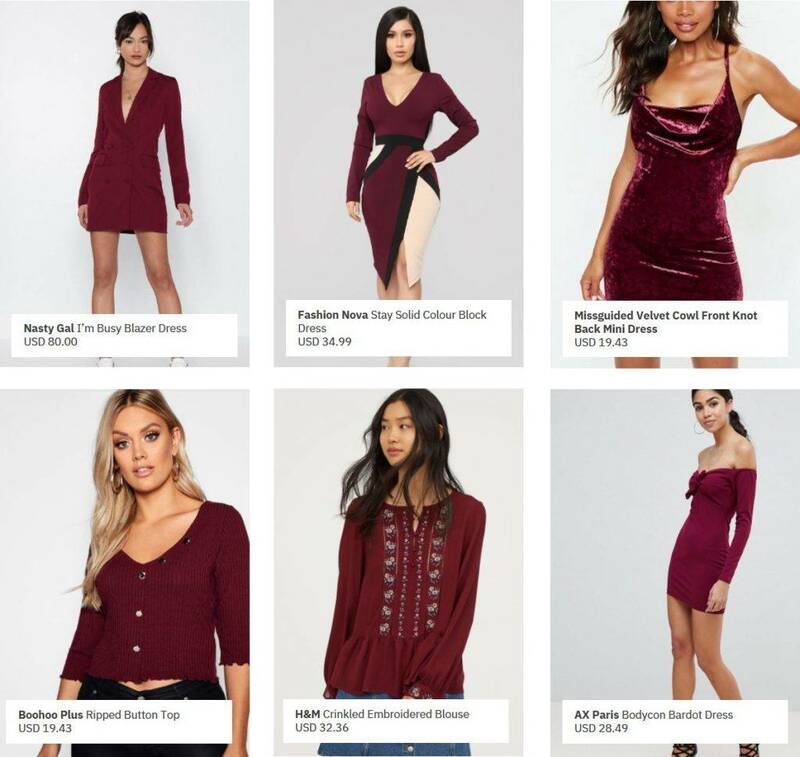 One of the most popular colours this season, this deep red hue was commonly found across dresses and tops, in clean lines and sleek silhouettes. Embroidered tops and off-shoulders underperformed this season. This green shade was prominent in dresses made of luxe material such as satin and velvet, and was well received in outerwear such as coats and jackets. Items with spring/summery vibes did not fare well among consumers. Similar to the fall/winter runways, classic coats and jackets in this shade were very popular among consumers. Non-classic silhouettes in Martini Olive were not received well this season. Coats and jumpers with a minimalist design were very popular for this spicy mustard colour. Floral printed tops and dresses, on the other hand, were unpopular in this shade. 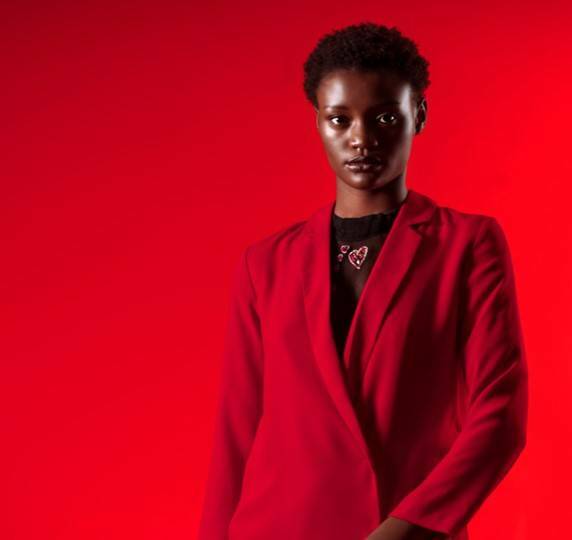 The most popular colour this season, this outgoing red shade was commonly found across blazers, coats and dresses, also in clean lines and minimalist design. Ruffles and printed dresses in this bright shade were less popular this season. Outerwear and dresses in clean lines and simple silhouettes were well-liked in this electric blue hue. In contrast, printed tops and dresses in this shade did not receive the same attention. This punchy orange hue was commonly found in outerwear such as coats, jackets and jumpers in clean lines and simple silhouettes. Tops and blazers with overpowering details and patterns did not fare well in this colour. 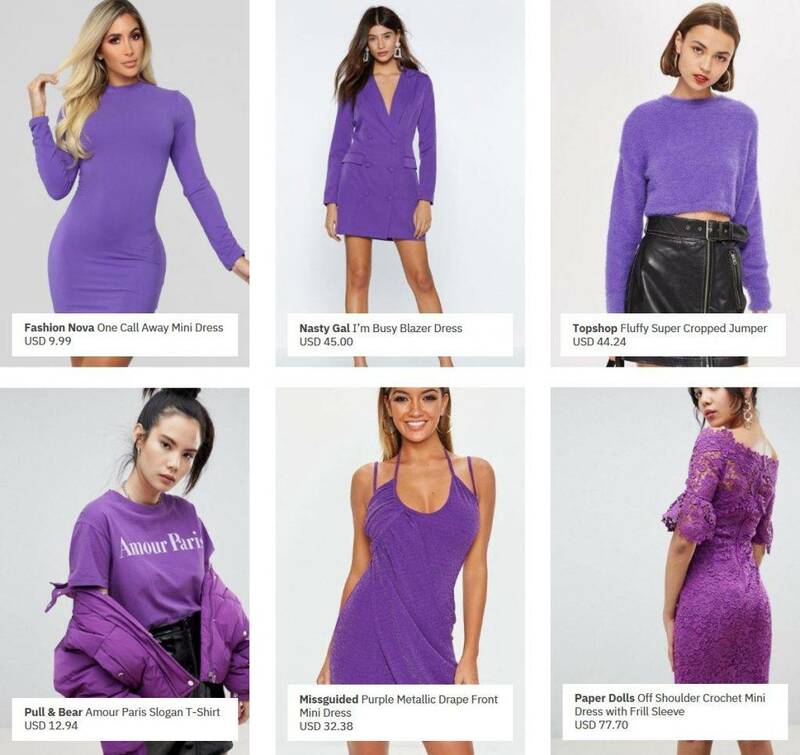 Suitable with Ultra Violet’s characteristics of self-expression and individuality, the bestselling styles in this colour comprised of playful dresses, as well as jumpers and sweaters. Slogan t-shirts and summery dresses were not received well this season. Jumpers and t-shirts with a minimalistic design in this light purple colour dominated the bestsellers list. Clothing with summery vibes, such as cropped tops, off shoulders and skater skirts, did not do well in this shade. Simple, minimalist tops and oversized knitted jumpers were received well in a brighter shade of Limelight as it balanced out the effervescent aura of this colour. Sundresses and cami tops in this shade, which would have been popular during spring and summer, did not garner the same results among consumers this season. The New Shades: Fall/Winter 2018 colours caught many by surprise, as it transitioned away from cyclical trends – showcasing more bold, rich and explosive non-traditional colours that would otherwise be mistaken for the spring/summer season. 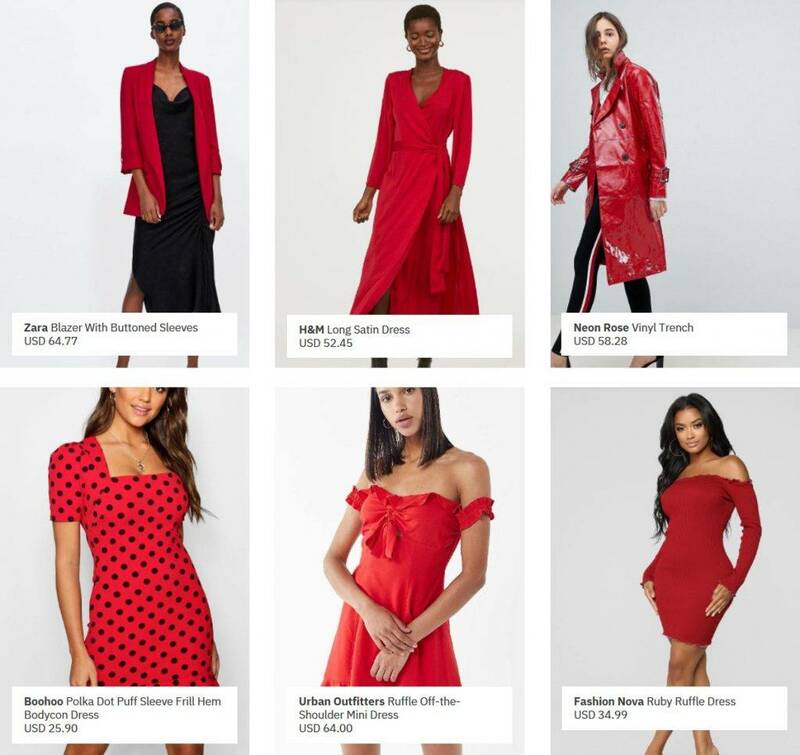 Red was a clear standout this season as it reached the mass market across major categories from Dresses to Outerwear, further proving its popularity when it garnered a high sell-out for a non-classic colour in fall/winter. Though the colour palettes introduced this season were more daring, most of the end products were beautifully assembled in clean, simple silhouettes. With the use of satin and velvet materials, certain shades such as Quetzal Green and Red Pear exuded elegance. Risky Classics: Judging from the new-in SKU colours, the bulk of assortment still comprised of the classic neutral shades of white, brown and blue that accounted for more than 60% of the total assortment. However, these core classic colours had proven to have had a tough season in FW2018 with less than optimal sell-out performance across the top 10 e-tailers observed. 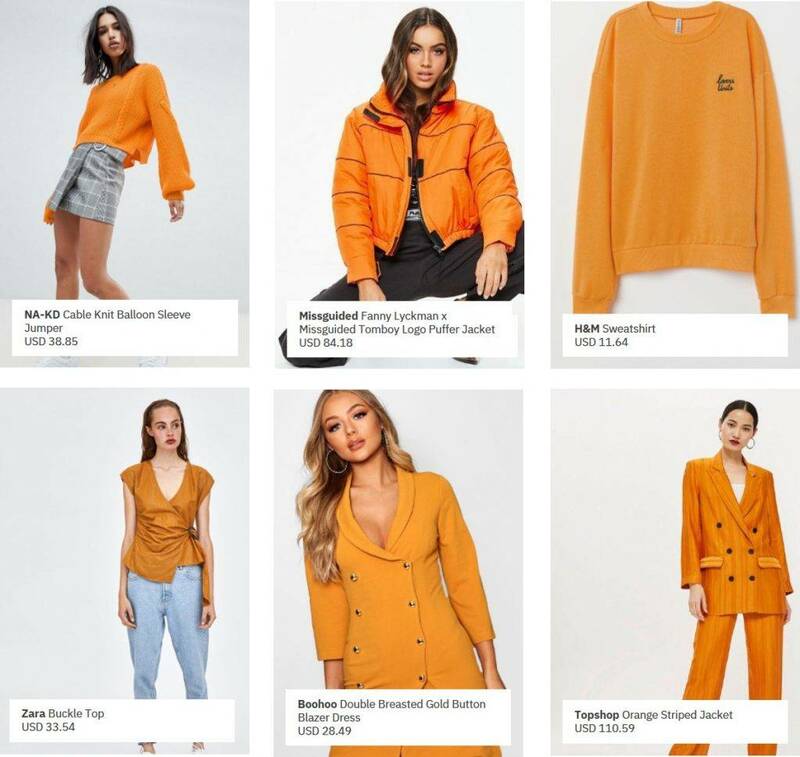 Balance Trending Colours: While Pantone established itself as the colour trendsetter, brands may wonder if the forecasts will translate to sales. 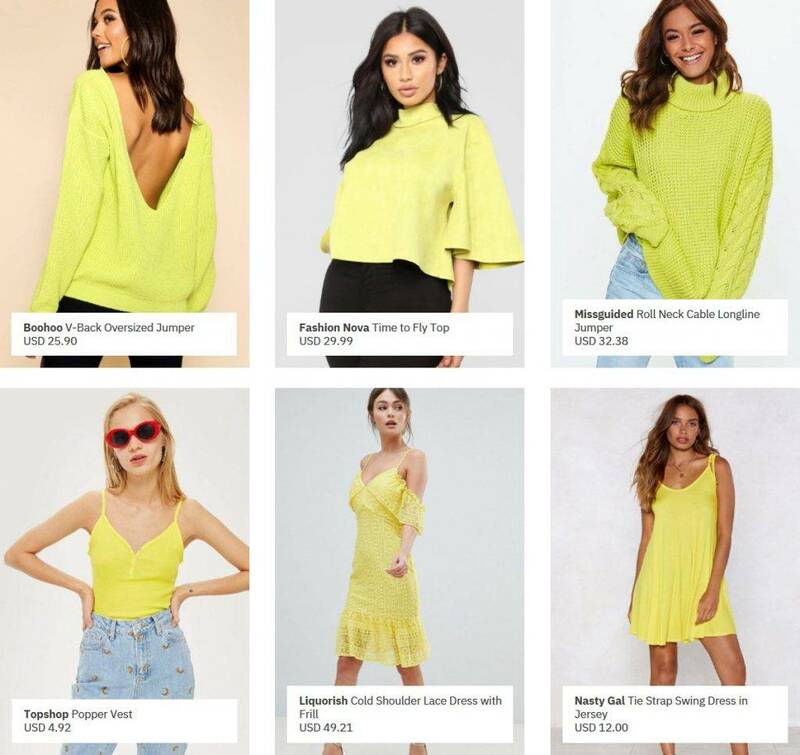 When the neon version of Limelight was introduced in this season’s key colours, it was backed up and made popular by celebrities such as Kim Kardashian in August. Other celebrities like Kendall Jenner, Ashley Graham and Blake Lively jumped on the bandwagon, as they were seen wearing a variation of this colour towards the end of 2018, the neon trend is likely to carry on into 2019. Although unconventional colour choices are harder to predict and get right, choosing to disregard it altogether would lead fashion brands to missed opportunities. The key is managing a balanced colour portfolio by trialling in smaller quantities. Pay Attention to Data: Classic colours will always remain popular but how do you determine which trending colours to invest in? Knowing your target consumers, supported by data, will assist in making an informed decision on which unconventional colours should be introduced. Even for the progressive fast fashion consumers, our data has shown that for unconventional colours, it is safer to keep styles minimalistic and in simple silhouettes.